I have said elsewhere and written here time and again that I feel I have total confidence in my ability to maintain my current weight of 155 pounds, having done that for the last five years. HOWEVER, that statement is based on the assumption that I am home and in total control of what I eat, preparing most of my own meals. Also, it assumes that I am able to ride my bike an average of about 20 miles a day. Clearly, that much exercise covers a multitude of sins. At the end of February I went with my girlfriend to Las Vegas to celebrate our second anniversary together. In this case, what happened in Las Vegas isn’t going to stay there. First of all, I realized that I was going to be eating a lot of wonderfully prepared foods. That fact could be a big potential stumbling block for my weight control program. Secondly, no way was I going to be pedaling 20 miles a day on a bike. There are health clubs in the big hotels, HOWEVER, again, I am leery about exercising in Las Vegas. The altitude is 2500 feet above sea level and my body reacts poorly to that. I almost fell off an exercise bike a few years back after just 20 minutes of riding as a result of this altitude. The bottom line is that I limit my exercise to walking around casinos and sight seeing. Not a lot of calories burned that way. So, I made a policy decision about eating. I was definitely going to enjoy indulging in the culinary fare available. After all, we were there to celebrate. I didn’t want to spoil it being a calorie cop. If I gained a pound or two in the five days we were there, so be it. I felt sure that I could burn them off once I got back home. that we ate there. But, I have selected some dishes that I think represented our dining experiences over the period. 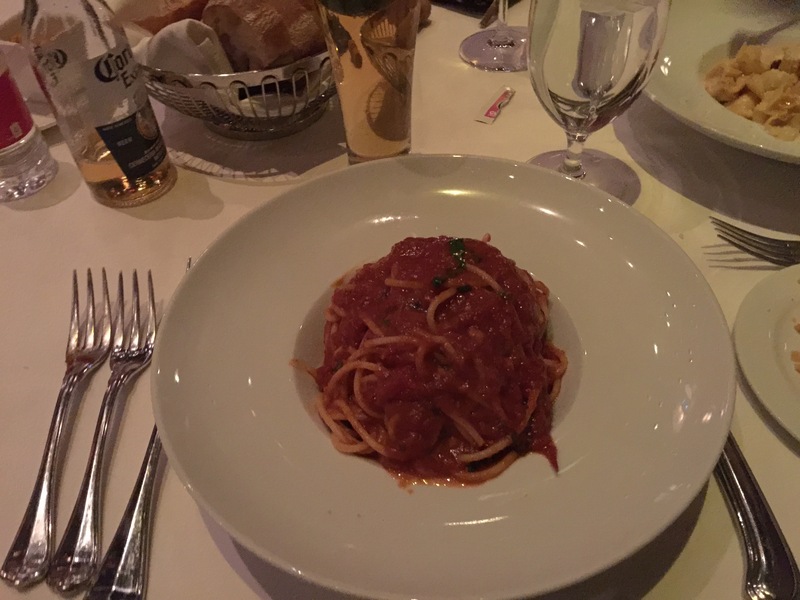 This was a pasta dinner at Rao’s in Caesars. Delicious meal. The next day we ate at a little French cafe in Paris, our hotel. This sandwich is bacon and cheddar cheese melted on a croissant. 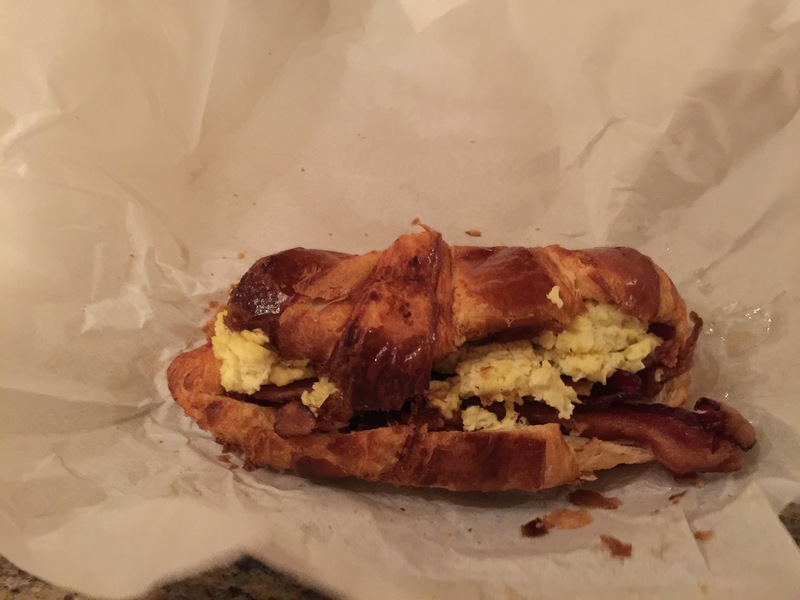 This bacon, egg and cheese croissant was mouth wateringly delicious and I have to believe it ran close to 1000 calories. We would have desserts at dinners, but split them rather than each go crazy with one. 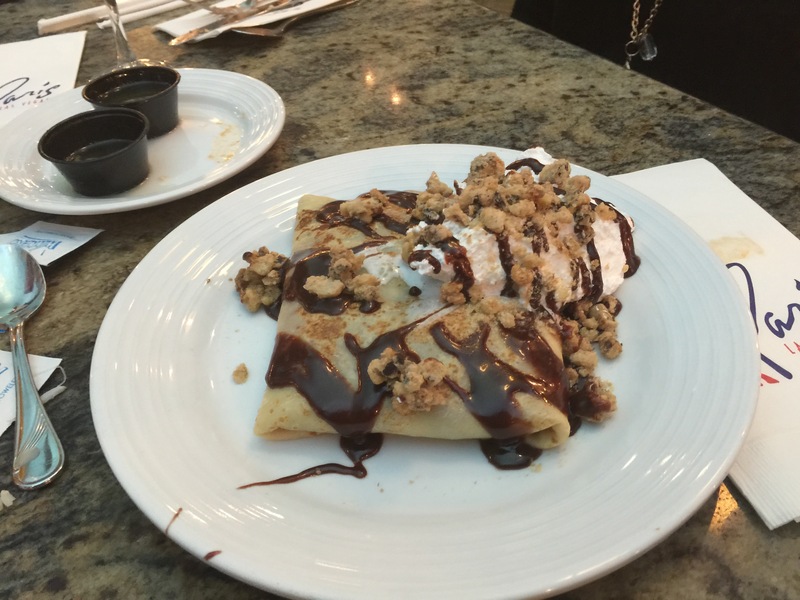 I think this chocolate and whipped cream covered crepe came from another of the French restaurants in Paris. Although we don’t usually do the buffets in Las Vegas because there is so much food on them, we did one on this trip. 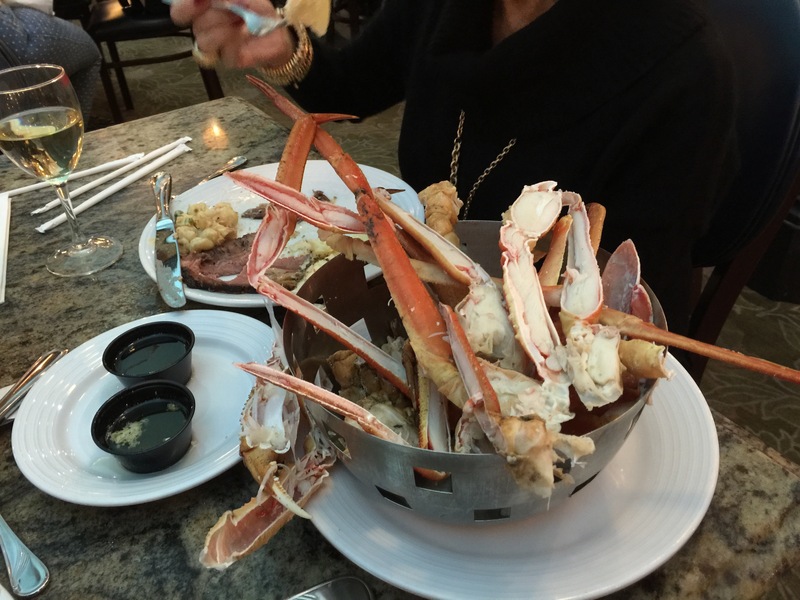 One of the entrees was crab legs. Bucket of crab legs from the buffet. 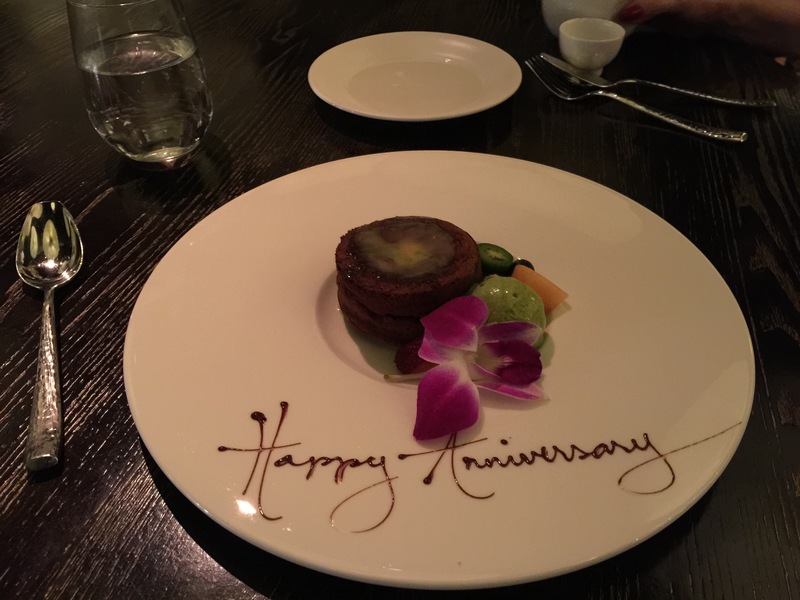 Our anniversary was February 28 and we celebrated at Nobu in Caesars Palace. I have been eating sushi since I was first introduced to it in the mid-1970’s at a press party. I love it and eat it often. I can honestly say that in close to 40 years of eating sushi I have never experienced anything like the dishes at Nobu. I believe there are 35 of them in a number of cities all over the country. If you have a chance and a few extra dollars, I recommend a celebration dinner at one. 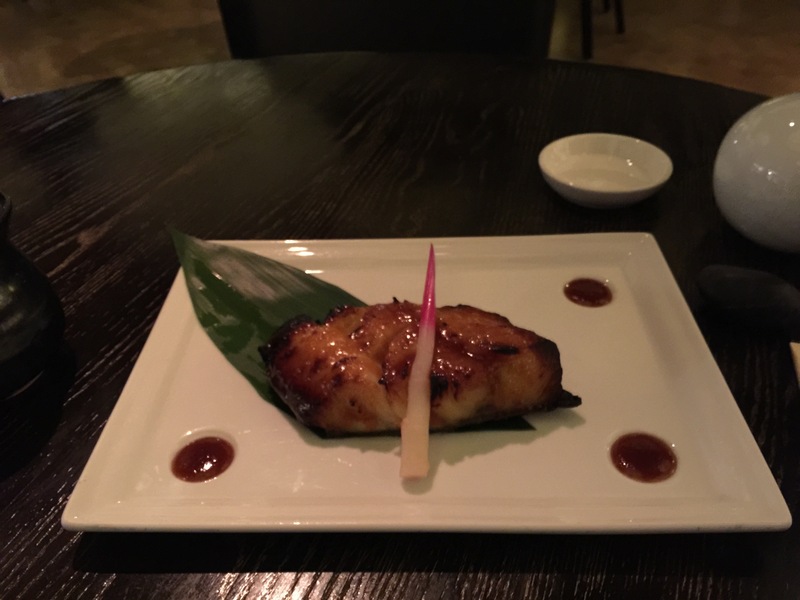 Besides being gorgeously presented, this black cod from Nobu was literally melt in your mouth delicious. The final dish was our dessert at Nobu. I was so impressed with the way they decorated the plate. This was some kind of melted chocolate pastry that simply exceeded my descriptive powers. Again, we split the dessert. Just to fill in some details, we did go back to the little diner at Paris and I had their ham and gruyere croissant sandwich which was equally delicious and caloric. 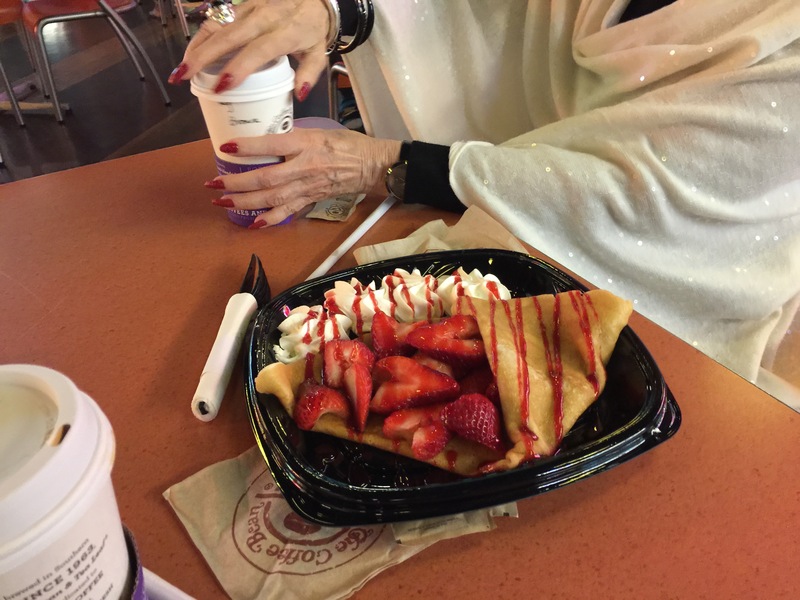 This was another food court meal, a strawberry crepe with whipped cream. Again, we split it. The final night we went downtown to the Chicago Brewery and Pizza parlor in the Four Queens Hotel and Casino. We split a couple of pizzas and wrapped up the remainder to eat on the plane going home. Okay, that should give you a pretty good idea of the kind of eating we did in four nights over five days in Las Vegas. Put your hand over the next paragraphs and guess – How much weight do you think I gained? Full disclosure, I figured I had added about two pounds on the trip and I was committed to some serious biking and exercise upon return. I hope you did as I did and made some kind of a guess about my weight. The following morning, I tipped the scale at … 155 pounds. Incredibly, I didn’t add a pound. I can’t explain that. My girlfriend said it was because we walked so much, but at my weight walking a mile only burns around 90 calories. I don’t think we walked that many miles. But, the scale doesn’t lie. The only thing I can think of is that I didn’t snack much between meals and we stuck to a regular schedule of meals. As I said at the top, “Good eating habits die hard.” I think I have become hard-wired to balance my intake and output. I didn’t get silly at a bunch of buffets and I didn’t fret at any point in the trip about what I was eating. If you have any observations, I would be pleased to hear them. That is an awesome feat. I must admit I didn’t fair so well on my vacation, I was 125 but when I returned after 10 days I tipped the scales at 130 no worries got back on my routine schedule and not indulging on the beer at the beach daily. 🙂 I am at 127 now, so just two more lbs to go….my Shepherd’s Pie didn’t help yesterday I am sure but I will work it off, I have Zumba tomorrow night. Thanks, Cupcake. lol Just staying 10 days in Las Vegas is an awesome feat. I don’t think 5 pounds is too bad, either, for that time period. It is so easy to just let go there. Enjoy your Zumba! Was there much alcohol involved, Tony? I find that drinking puts on the pounds on vacation. I love a pretty presentation and your dessert at Nobu fits the bill. Sounds like a lovely holiday! Hi, Vinny! Thanks for your comment. As a matter of fact, I don’t drink much, ever. I may have a glass of wine or beer on occasion, but mostly it’s just to clink glasses with my girlfriend. She likes a glass of wine with dinner. So, no, not much drinking on the trip. It was a great holiday! That just goes to confirm my theory — less drinking means less weight gain. I’m with your girlfriend on the glass of wine (or two for me) with dinner thing, especially when on vacation :). Ergo, I have more trouble with unwanted pounds creeping on after holidays. Right. Once again it all goes back to calories. Lots of calories in alcoholic drinks that add on to the meal. I used to be a big beer drinker, but I seem to have outgrown it. Your eating and exercise plan is normally so great. I don’t think 5 days in Las Vegas would be enough to have any adverse effect. I think you are right. Maybe I am paranoid about the damage you can do in a few days. In any event. I had a great time in Las Vegas and didn’t gain a pound. Thanks for your comment!